The EDISON 17 talks and poster sessions are scheduled in the Loma Pelona Center which is located on the west side of the main campus near Manzanita Village. 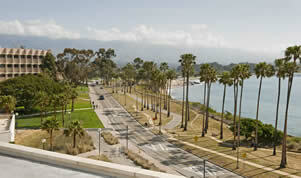 On campus housing is in the Manzanita Village Quad located on the bluffs overlooking the Pacific Ocean and the UCSB Lagoon. Manzanita Village is adjacent to the Loma Pelona Center. The EDISON 17 banquet, scheduled the evening of August 11, will be held at the Santa Barbara Museum of Natural History. Light refreshments and the bar will open at 6:30 p.m. with dinner starting at 7:00 p.m. The museum will be open to EDISON participants only (including EDISON guests) that evening so that you can enjoy the exhibits. Bus transportation information to get from UCSB to the museum will be updated to this location soon. Just a 10 to 15 minute walk from the UCSB campus, Goleta Beach offers sweeping views of the Goleta coast, the UCSB campus, and the Santa Ynez Mountains. This county beach has public restrooms, showers, barbecue pits, volleyball nets, and playground equipment. A short list of restaurants in Goleta and Santa Barbara.